A couple of weeks ago I mentioned Chester French were hooking fans up with free stuff. Well, they unleashed Jacques Jams, Vol. 1: Endurance this past Wednesday. Did you get it? No? Why not, it's FREE! 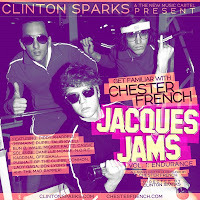 There's the link chesterfrench.com/mixtape ... go get yourself some free goodies and get familiar!